Abstract | The 1960s was the decade in which satellite technology was introduced to the television world via a series of live broadcasts. 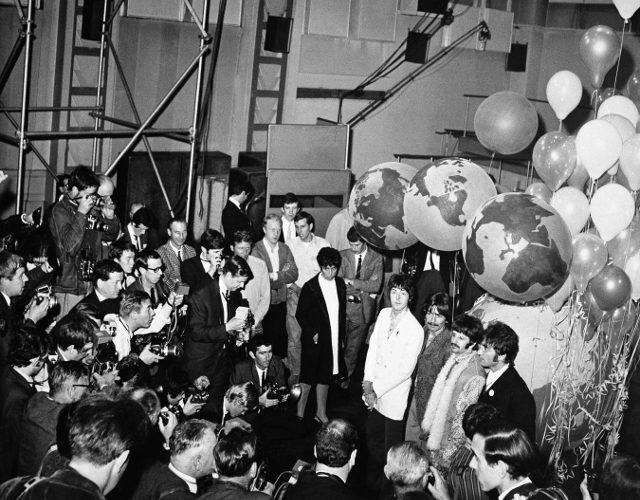 With the active participation of 46 stations, BBC’s Our World (1967) was undoubtedly the most globally far-reaching of them all. Conceived around Marshall McLuhan’s concept of the communicative global village, the special program took full advantage of satellites to reach a truly global audience and use the occasion to announce the dawn of globalization and what living in a small and thoroughly connected world would mean for its inhabitants. Prominent in the broadcast was the program’s Canadian segment, which aired right after the introduction and included an interview with Marshal McLuhan in the Canadian Broadcasting Corporation’s studio in Toronto. This paper considers McLuhan’s contributions both to the ideas and practices of planetary communication as well as his direct involvement with the production of Our World. I demonstrate how McLuhan’s understanding of the co-constitution of time and space not only set live television broadcasts apart from other temporal media but that, through these spatiotemporal affinities, One World can be considered to belong to the prehistory of our contemporary telecomputational technologies such as the Internet and mobile phones. Résumé | Les années 1960 ont été la décennie où la technologie satellitaire a été introduite dans le monde de la télévision par le biais d’une série d’émissions en direct. Avec la participation active de 46 stations, Our World (1967) de la BBC a été sans aucun doute été l’émission la plus diffusée à travers le monde. Conçu autour du concept du village planétaire de communication de Marshall McLuhan, le programme spécial a profité pleinement des satellites pour atteindre un public véritablement mondial et a saisi l’occasion pour annoncer l’aube de la mondialisation et ce que vivre dans un monde petit et complètement connecté signifierait pour ses habitants. Le segment canadien du programme, diffusé juste après l’introduction, a été mis en vedette et comprenait une entrevue avec Marshall McLuhan dans le studio de la Société Radio-Canada à Toronto. Cet article considère les contributions de McLuhan aux idées et aux pratiques de la communication planétaire, mais aussi son implication directe dans la production d’Our World. Je démontre comment la compréhension de McLuhan de la co-constitution du temps et de l’espace non seulement sépare les émissions télévisées en direct des autres médias temporels, mais aussi, par ces affinités spatio-temporelles, comment One World peut appartenir à la préhistoire de nos technologies de télécommunication contemporaines comme Internet et les téléphones mobiles. The 1960s was the decade in which satellite technology started to be incorporated in the production of live television programs. However, with the active participation of 46 stations from round the world, BBC’s Our World (1967) was undoubtedly the most global in its reach. Conceived around Marshall McLuhan’s concept of the communicative global village, the special program took full advantage of satellite technology not only to reach a global audience but also simultaneously produce its live televisual content from different locations around the world. Satellite technology allowed Our World to function as a planetary announcement of the dawn of globalization and what living in a small and thoroughly connected world would mean for its inhabitants. Our World also played a major role in defining the visual and presentational style of not just live broadcasts, which became widespread with cable television in the decades to come, but both the aesthetics of the 24-hour cable news and the mainstream Internet. According to the media scholar Lisa Parks, the production of Our World in 1967 was largely predicated on the ratification of a UN treaty enabling the free use of the earth’s outer space in accordance with international law and banning its monopoly by any single nation (Parks 76-77). The countries involved urged the producers to focus on humanitarian themes and purposes. The producers, on the other hand, used the mass audience of the program not only to publicize but also visualize urgent global issues. Park emphasizes that Our World emerged at the peak of the Cold War, the space race, and during the decolonization of the developing world (Parks 75). It was as if all the villages of the globe were brought together by the convergence of media and political interests to pronounce the dawn of a new era of global cooperation and competition not just between the west and east but also the north and south. Our World was broadcasted on June 29, 1967 with an estimated 500 million viewers in 24 countries. It required more than two years, thousands of technicians, miles of cable, and $5 million dollars to produce. Prominent in the broadcast was the program’s Canadian segment, which aired after the introduction and included an interview with Marshal McLuhan in the Canadian Broadcasting Corporation’s studio in Toronto. In this illuminating conversation, which contains the most compressed version of the philosopher’s concept of the Global Village, the producers lay the theoretical ground of the show’s propositions and made explicit Mcluhan’s centrality to their concerns. In The Medium Is the Massage, McLuhan and Quentin Fiore wrote: “Ours is a brand-new world of all-at-once-ness, time has ceased space has vanished we know live in a global village a simultaneous happening” (63). The technological rebirth of the world as a global village was emphasized in the start of the program with images of newly born babies from around the world. Our World included segments about various national efforts to increase the world food supply and find solutions to housing problems. The show also highlighted examples of skills in sport and adventure from, notably, a professional Canadian female swimmer breaking her own world record live in an open pool in Vancouver. Perhaps the most entertaining sequences of the program were rehearsals of Lohengrin at the Bayreuth festival, Franco Zeffirelli rehearsing a filming of Romeo and Juliet in Italy, Leonard Bernstein and and Van Cliburn rehearsal at the Lincoln Center in New York, Joan Miró in his studio in France, and The Beatles and their producer George Martin recording their hit song “All You Need Is Love” in London. Our World began very early Monday morning in Australia and Japan, Sunday afternoon in North America, and late Sunday evening in Europe. However, for its duration, the viewers from these different time zones around the world were bootstrapped to a new technology capable of uniting them both spatially and temporally. This form of global presence was never technologically possible before. Today’s networked media takes for granted the mass participation of millions of users as the precondition for its authority and legitimacy, but in 1967 the audience’s knowledge of the fact that millions of others were also watching the program added a new dimension to the televisual experience. The accessible liveness made a mediated experience almost as tangible, real, and authoritative as any physical encounter with the world. This mode of experiencing time is what I refer to as televisual intersubjectivity, a mode that only enhanced as we moved from live satellite broadcasts to the 24-hour cable television cycle and later on to the Internet’s own global temporality. However, this intersubjective and participatory immanence could only be possible by way of the media’s reorientation of the viewers’ attentional resources away from their actual and physical experience of the world and into the audiovisual reality of the television monitor. The togetherness can only become tangible if the cognitive consciousness of the audience is drawn into a convincing virtual world with its own temporal logic. This definition of temporality is much closer to McLuhan’s and goes against its contemporary phenomenology and its Marxist recuperation via Walter Benjamin’s philosophy of history. In this sense, temporality is not grasped exclusively through inner time of consciousness nor the measured outer time of the world, but rather the way the passage of time from the standpoint of external beings, including technologies, affects our understanding of being and time. It was through utilizing the potentialities of this technologized intersubjective temporality that Our World was able to draw millions of viewers into itself, providing a new perspective from which one could see the Earth as a thing situated outside of the viewers’ physical and local realities, thus transforming how they understood the present in retrospect. One can only notice how this model of understanding complex facts is similar to how we experience the Internet as a whole today. It was the first time in history that humans could watch the planet as a single entity in both time and space, similar to how Yuri Gagarin and Neil Armstrong had previously viewed the Earth from the outer space. It is noteworthy that the style and visual design of Our World had ramifications for both the presentation of live coverage on television and for how objective news and commentary were to enter public space in the future. For instance, the humming and buzzing environment of the control room from Toronto’s CBC studio where McLuhan was interviewed foreshadowed what in the 1990s became known as the aesthetic frame for 24-hour news broadcasters such as CBC Newsworld and CNN. In addition, by combining live use of the television studio alongside maps, photographs, charts, and live footage from remote locations, the program pointed to the computational future of the media in which the credibility of the present is established in a network, or what McLuhan would term a “mosaic” of different types of information. Looking back almost 50 years at this experiment in mass communication, one might ask, was this only the start of a new life for the medium of television, or is the program also the harbinger of our post-cybernetic planetary life? To answer this question, we should measure Our World against three different philosophies of history and their temporalities. This consideration highlights the significance of the program to our shared televisual history in threefold. The classic conception of history treats its subject as a concrete object from the past with an exact archaeological point of origin, worthy of unearthing and burnishing by the historian. In this respect Our World constitutes a time capsule of the modern western liberal weltanschauung, a term defined by the Viennese art historian Alois Rigel and expanded by the Hungarian sociologist Karl Mannheim. According to both, worldview is not an ideal category but rather the material and formal capabilities of artifacts, especially monuments, to preserve the virtues, aspirations, practices, and technologies of the past and present times. As a media monument, Our World speaks to both the form and content of the postwar Modernism advanced by the US and its Western allies as they competed internationally with Soviet communism for the developing world. Our World is also significant in our contemporary conception of history as formulated by Walter Benjamin in the “Theses on the Philosophy of History.” For Benjamin, historical consciousness is the backward reconstitution of the ruins of the past in the present against the inevitable force and direction of futurity. This particular conception bears resemblance to how the Husserlian phenomenology describes the temporal process of experiencing the world as well as how Norbert Weiner configured the temporality of cybernetic feedback loops (34-35). This conception of history is also graspable through McLuhan’s own characterization of the future as being graspable only through the rear-view mirror (McLuhan and Fiore 110-11). Yet there is a third and speculative concept of history associated with Promethean realism, to use Ray Brassier’s term. One can arrive at this conception particularly via Reza Negarestani’s reading of Hegel and Suhail Malik’s concept of risk rationality in relation to the operational logic of finance capitalism. These thinkers share an understanding of history as a temporal platform for how future and the past struggle against each other in the substrate of the present time. From these more recent perspectives, Our World defines the moment in which the alien and artificially intelligent future, channeled through the figure of McLuhan, travels back in time to liberate the present from the clutches of the past. From these perspectives, reason, even if abstracted from its biological substrate and operationalized via our media technologies, can still play an autonomous role in shaping the future history. Thus, if one day in the future, our intelligent machines find the capability to look back into the mirror of history, they would be able to recognize in Our World and particularly the McLuhan segment a noticeable trace of their own existence. There can be no doubt that the television monitor—in general, as the ubiquitous optical data output device and live satellite television programming, and in particular, for its immanent temporality—are the harbingers of the planetary-scale computation and Internet today. However, we can also claim that McLuhan was at least unconsciously aware of the futurity of the television medium, as evident in Our World’s opening interview with the author. McLuhan’s use of x-ray as a metaphor to explain the depth of televisual experience compared to the superficial nature of print media not only reveals the specific epistemic qualities of television but also points to the further deepening of this x-ray effect as we shift from the analogue signal via satellite to the digital one via the Internet. In addition, McLuhan’s clearly understands the mosaic and fragmented essence of the television paradigm as reflecting an era in which the separation between the spectator and the participant can no longer be maintained. It is not hard to see how this conflation of object and subject, user and used, and consumer and producer is reaching its peak during our current Internet paradigm. At the heart of these transformations rests the question of time, its qualities and logic during social, political, and epistemic transformations. Here, McLuhan recognizes the temporal revolution which television facilitates as an inexpensive and universal dispenser of information in a time-based form and its intensification via inexpensive live satellite broadcast. In short, for McLuhan, these media transformation were essentially about the fundamental change in the relationship between humans and the notion of time mediated by media technologies. CBC: Good afternoon. This is the control room here in Toronto where viewers in Canada will see our world this afternoon. It’s one of 45 control rooms around the world, linking the world, or the developed world, in this first global television program. I have with me in the control room Professor Marshall McLuhan, the so-called prophet of this electronic communication age. I hope you don’t object to that word, “prophet,” you must be tired of it. CBC: I don’t know if you know what is going around here Professor McLuhan. I don’t. MML: It’s a real humming, buzzing confusion. CBC: Can you say what message the medium has on the world this afternoon? MML: Well, I can say right off for example that everyone will look at this program as if it were something they have already seen before, with just a little addition of this and that, because that is the inevitable way in which we look at everything. It’s the same old thing with a little item or two added. In fact, what is happening around the world today, is what has happened with the [Montréal] Expo: a huge mosaic has been created in which, in effect, an x-ray of world cultures, not a story-line, not a perspective, not a point of view, but a kind of x-ray through this mosaic, is created in which everybody can participate. Everybody is surprised at Expo at how deeply they appreciate and participate in the show. Nobody seems to realize why it is so unlike other world fairs. And I think this show this afternoon will have some unexpected repercussions in that way. People will be drawn into it as participants, whereas they are merely viewing themselves as spectators at this moment. CBC: Doesn’t this, though, it’s creating an entirely new intellectual spirit, climate, for those who can communicate. Doesn’t it present another problem of dividing those who can from those who can’t? MML: Well, what is called for example a generation gap today, the TV generation of kids, have a completely different set of perceptions from their parents. Their parents grew up in a visual world like the world of movies, where they have cameras and pictures and points of view. The kids have grown up in an x-ray world. The TV camera does a perpetual job of x-ray on them and they take this for granted. X-ray means depth, x-ray means participation in depth in whatever they are doing, and calls for a totally new kind of commitment to everything they are doing. That is why when they encounter situations in which they are merely classified entities as in the school room; they don’t feel wanted, they don’t feel needed, they just drop out. Now, this strange new all-at-once situation in which everybody experiences everything all at once creates this kind of x-ray mosaic of involvement and participation for which people are just not prepared. They have lived through centuries of detachment, of non-involvement. Suddenly, they are involved. So it’s a big surprise, and for many people a kind of exhilaration. Wonderful! MML: They are trying to live in the rear-view mirror. They are still desperately trying to get an image of themselves in a situation that is familiar and known, whereas in actual fact the situation that they find themselves in is not well known, it’s utterly surprising and terrifying. The people have always, in all ages, Stan, have always been terrified of the present. The only people that seem to have enough gumption, or nerve, to look at what is happening right under their nose are artists. They are specialists in sensory life. They just deliberately look at the present, you know, as if they dared it to ruin, or do something to them. They are like Perseus and the Gorgon. The artist looks into the mirror of art and says, the heck with the Gorgon’s image, I’m not terrified. But most people simply expect, when they look at the present, to be turned to stone, as by the Gorgon’s spell, and they are terrified. Therefore they prefer the rear-view mirror. Nearly everybody who looks ahead, as it were, is in effect looking at the rear-view mirror, and if people try to prophesize about today’s show, they will be steadfastly looking in the rear-view mirror. MML: They aren’t watching the show at all. CBC: And they are not in the rear-view mirror. They are in the past, centuries, and isn’t that gap widening as our rocket-like society goes forward? MML: You know, something like Expo, though, creates a mosaic of all those societies as well as all the latest ones, and everything happens at the same moment. You can be in Beirut, or in Tokyo, or in New York at the same moment, in this kind of mosaic world of all-at-onceness, and so, in effect, the backwards countries have to become contemporary simply because of this instantaneous quality of the mosaic. To be brought into the show, they are all participants. It’s no longer a question of philanthropy or just do-gooderism. They just realize these people are part of the show and they have to get into the act, until we put on their makeup or something they can’t go before the camera, so, the whole backward territories of the world are being upgraded at very high speed. In fact, one of our most mistaken efforts in upgrading is warfare, because when you fight a backward country you in a sense educate it to hurry its education up into the present. That’s the way Julius Caesar did it. CBC: But didn’t we just see an example in the Middle East where one nation had an army which was a complete master of this mechanized society, fighting another which was mentally caught in a camel age. MML: You can see that the generation gap there, or the technological gap, created frustration (inaudible) even though the war didn’t. MML: But you see, in our own homes, the generation gap between child and parent is fantastically great, but we always accepted that as a normal, natural growth gap. Now, today, because of an enormous speed up of information, the child is becoming an adult, the adult has to acquire all the empathy and intuition of childhood in order to live with his own children. The gap between adult and child is just disappearing overnight. That is as big as any revolution as any backwards country has to face when it’s being updated into the 20th century. The biggest revolutions in the world are taking place under our own roofs, at our dinner tables. This all-at-onceness just wipes out the old distances and times between age groups, ethnic groups, civilized groups, and so on. This kind of speed up enables you, for example, at Expo, to see all the cultures of the world, in x-ray form, in depth. What you encounter at Expo is not history, but the immediate experience of these countries. You walk into a pavilion and you experience them not as they were, or they will be, but as they are, as an immediate experience, as immediate as the smell of a cigarette. MML: Ah, ah! Right, the 1917 October Revolution was entirely the result of the print technology of that era. Yes. CBC: But do you find in those two countries today, any indications of, perhaps, the problems they inherited from the printing press? MML: Oh yeah, because the United States is always looking for blueprints and always looking for solutions in forms of classified data. This, of course, is utterly alien to Russian culture with its oral traditions of involvement, and so there are great gaps, culture gaps, between the US and Russia. The Russians haven’t had time to become completely permeated with print culture by any means. MML: No, and a man who resented the coming of the European civilized blueprint into the Arab world imposing on them. What we considered, that is the way we have always thought of civilization, giving the benefits of civilization to Africa has always come down to print-oriented people as the laying down of new blueprints, new times for work and education, programming, but today it has to be done by dialogue, by a completely new kind of involvement and participation in their problems. And the old blueprint method is disappearing without questions. Television is an x-ray not a blueprint, so it goes right inside problems, inside cultures, in depth. There are so many numerous stories that express the grievances and the tensions that arise from these situations. I wish we had time to rehearse them. CBC: I’m afraid that our time is up. I’ve got to get down to the studio. Many thanks, Professor McLuhan. Benjamin Walter. “Theses on the Philosophy of History.” Illuminations: Essays and Reflections, Houghton Mifflin Harcourt, 1968, pp. 253-264. Brassier, Ray. “Prometheanism and its Critics” #Acelerate Reader, edited by Robin Mackay and Armen Avanessian, Urbanomic/Merve Varlog, 2014, pp. 467-487. Husserl, Edmund. On the Phenomenology of the Consciousness of Internal Time (1893-1917). Kluwer Academic Publishers, 1991. —. The Phenomenology of Internal Time-Consciousness. Indiana UP, 1966. Malik Suhail. “The Ontology of Finance: Price, Power, and the Arkhéderivative.” Collapse VIII, edited by Robin Mackay, London: Urbanomic/Sequence, 2014, pp. 629-812. Karl Mannheim, “On the Interpretation of Weltanschauung,” Essays on the Sociology of Knowledge, (London: Routledge & Kegan Paul, 1951), 33-83. McLuhan, Marshall and Quentin Fiore. The Medium Is the Massage, Penguin Books, 1967. Negarestani, Reza. Intelligence and Spirit, Urbanomic/Sequence, Upcoming. Parks, Lisa. “Our World, Satellite Televisuality and the Fantasy of Global Presence.” Planet TV: A Global Television Reader, edited by Lisa Parks and Shanti Kumar, NTU Press, 2003, pp. 74-93. Riegl, Alios. Historical Grammar of the Visual Arts. Zone Books, 2006, pp. 55-56. Weiner, Norbert Wiener. Cybernetics: Or Control and Communication in the Animal and the Machine, MIT Press, 1948, pp. 30-44. Featured Image: From left, Paul McCartney, George Harrison, Ringo Starr and John Lennon of the Beatles pose for photographers during a break in rehearsal for a performance of their song, “All You Need Is Love,” on June 25, 1967. (AP Photo) Used with permission. The temporal logic of Walter Benjamin’s angel of history is similar to the phenomenological experience of human subjects. In both cases a contingent and unexpected encounter with the future is made sense in the present vis-a-vis the subject’s reconstruction of the past in which the Benjaminian “ruins” stands as a metaphor for the disintegrated nature of past information. See both Benjamin and Husserl. Transcribed with help by Manuel Correa and Olivia Leiter, certificate students at the Thew Centre for Research and Practice.